This blog will usually be about the price of gas and what we can do about it. I am working on the petition and that will be ready soon. Thanks for asking! I wanted to give a small endorsement to an award-winning, freelance developer that I have had the good fortune to stumble upon. If you need custom Excel or Access work done, you can do no better than Daniel Ferry. Whether it’s complex formulas or databases, VBA coding, or VB6 programming, he has done fantastic work for me. Besides what I think, he comes highly recommended on RentACoder.com where he’s rated at the 99.7 percentile, higher than over 215,000 programmers there. He also has a stellar rating on Guru.com with many endorsements. I can’t say enough about this guy. He’s a true expert and professional with 20+ years doing this. He has sent me some chapters of an Excel Development book he’s currently finishing called, “Excel Hero.” All I can say is OMG, I never new just how much power is available in that program. You could run just about any department, business, organization, or whatever with that thing. William LaJeunesse at Fox News has broken and unbelievable scam that Congress has endorsed. Rep. John Shadegg, R-Ariz has exposed the scam. Currently our government is subsidizing the production of American Biodiesel to the tune of $1 per gallon. On the surface that may be a good thing, or not, depending on your point of view. BUT, here is the scam; if just one thousandth of the volume of the product is American then the whole volume is considered American. The scam operators pull a real fast one by purchasing cheap Biodiesel made from South American sugar cane or Asian palm oil, ship it to the US where the minimum one thousandth volume is added (SPLASH – and it is not even Biodiesel that they add, they splash it with regular diesel). Here is the worst part: they take the final product and ship (DASH) it to Europe earning a dollar per gallon subsidy from Uncle Sam. That means we are all paying so that Europe can have access to cheaper Biodiesel than we do. This is costing us hundreds of millions a year. Read the full story HERE. What the Frack is Going On with the Price of Gas? We can get gas back to $1.50 per gallon overnight. “Index Speculators” are responsible. Our government has allowed this and they can fix it. Let’s demand they do. Read this post for details. So, how did this happen? Is it a coincidence that the last time we saw gas under a buck here in California was in 1999? Everyone thinks that gas is so high because of simple supply and demand. Isn’t that what we learned in school? In open capitalistic markets the price of a commodity is governed by what regular folks are willing to pay for it. If a seller is asking too much, the buyer will go to a competitor willing to sell for less. There must be a shortage of oil, right? How often have you heard that emerging (and potentially super) economies like China and India are placing unprecedented demands on the supply of oil as their industries expand. There is truth here, but misleading it is. The production of oil has increased dramatically in response to higher prices over the last three years. Oil wells in backyards that have not run in decades are churning night and day. The big companies are bringing on supply faster than at any time in history. OPEC has increased production (begrudgingly). In addition to unprecedented supply, America (the biggest consumer of oil by far) has markedly cut its consumption (by over 500,000,000 barrels this year alone). The increased demand by young economies has not threatened our supply. Far from it. We have risen to the challenge. The supply of oil versus its demand is in historically favorable territory. In a normal open market, the increased supply would mitigate the higher price. The price would temporarily spike as the demand first grew, and then ebb when the supplies grew; finally a balance near the original “normal” and “low” price would be struck. 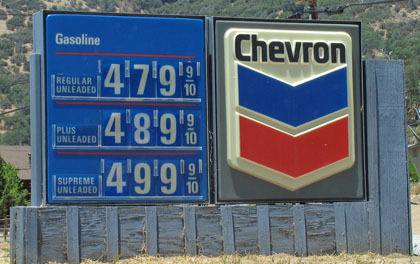 Gas should cost $1.50 in the summer of 2008, here in California! This hasn’t happened. We’ve seen the spike, but instead of a spike it’s turned into a ramp to the stratosphere, with no end in sight. 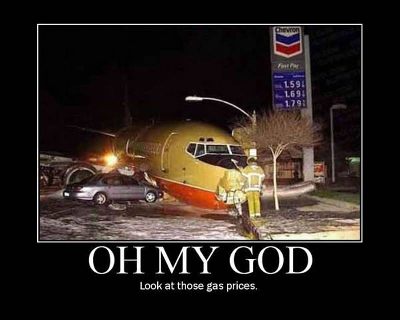 Some economists are now saying that $6 and $7 gas is near. Are we going to let that happen? Do we have a choice? I hope we don’t and yes, we have a choice. The problem is far worse than most people realize. You know it now costs over $100 to fill-up your SUV, but that is the tip of the iceberg. Our nation runs on transportation. Ever noticed how many trucks are on the freeway? Consider this: diesel is more expensive than gasoline. What are those trucks carrying? They are carrying products that you and I are buying at the grocery store, in fact, every kind of store from the largest mall to the smallest corner shop. Every product you need or want is going to go through the roof in terms of cost. Many already have, but far more increases are coming… on everything. Bought any groceries lately? Food products get whacked three times by the high cost of fuel. First the cost of fertilizer is spiraling out of control because it takes enormous amount of energy (oil) to make it. Second, while we have the most productive method of farming the world has ever seen, it is entirely based on oil (tractors, combines, harvesters, etc). Thirdly, the food has to be transported multiple times before you get a change to throw never-before-seen percentages of your paycheck at it. What happens if gas hits $10 a gallon? You think that is impossible? People in Europe are already paying more than this. It is coming. Listen, 30 years ago we received the first wake-up call. OPEC strangled our supply of oil. I remember people waiting in line for hours to fill-up. Rather than seeing this as a national security threat (which it most certainly is) our leaders completely failed us, conservative and liberal alike. One would have thought that in response to such a threat that we would have embarked on sweeping policy changes to ensure that we have adequate energy domestically for all time. One would have thought that we would have built hundreds of new refineries to turn oil into gas. One would have thought that we would have built dozens of nuclear power plants. One would have thought that there would be cheap solar panels on every rooftop, and millions of wind turbines. One would have thought that every car sold in this country would be mandated to run on flex fuels or alternative fuels. In the seventies our nation received an earth shattering fright. Tiny middle-eastern kingdoms had a very real stranglehold on the life pulse of the strongest and richest country in the history of civilization. What did we do to ensure that they could not do it to us again? So, besides Regan’s loosening of OPEC’s hold, we surely did not get sweeping policy changes to ensure that we have adequate energy domestically for all time. How many of those hundreds of new refineries were built? Zero. That’s right, not one new refinery in over 30 years! Nuclear power plants: none. Unbelievably, we have not built one new nuclear power plant in over 30 years. While at the same time, France, of all countries, has succeeded by switching a full 75% of their entire electrical production to nuclear. Is France more advanced or capable than the USA? In energy production, the sad answer is yes. Who is to blame? All of our politicians. As a group, they have failed America to such an extent that someone should fill Boston Harbor with oil and call a party. Is it mandated that all cars sold in the US run on flex fuels or alternative fuels? Not only is the answer a resounding no, the percentage of cars that actually have this ability is a minuscule fraction of one percent. Solar, wind? The same failure. It is as if we never experienced the warning in the first place. The magnitude of this failure is difficult to measure and impossible to understand; it was entirely preventable and every politician should be fired. There is a way to take the mounting pressure off of 300 million Americans overnight. A few years ago, the regulations for futures trading for oil were subtly but perilously changed. This needs to be reversed now. In the past only businesses that intended to use the oil at some point bought oil futures, as a hedge on pricing. That was healthy for the market and is what Regan had in mind. Now anyone can buy the futures and a new class of buyer, called “Index Speculators,” has recently destroyed the oil futures market. The Index Speculators are comprised primarily of institutional investors and pension funds that will never take delivery of the oil. So the price just keeps spirally upward. They now collectively own more oil (on paper) than all of the big oil companies combined! This problem is magnified by another troubling issue. If you want to buy stock on margin through your broker, you need to pony up at least 50% of your own money. The Index Speculators on the other hand need only pony up 5% of their position. Now how high do you think this paper price-war for oil is going to go when Index Investors are able to borrow 95% of their paper investment with hundreds of billions of dollars of their own to invest in oil? We are on the precipice of the abyss and the average person in this country has never herd the real reason. Every American needs to demand that our government finally do the right thing. Let’s start with having the government real-in the CFTC (Commodity Futures Trading Commission). The President or Congress could have the CFTC change their policy in this regard overnight. Oil would go from $150 a barrel to $50 overnight. If we then demanded that the government actually do all of the initiatives above, plus a few others. In addition to major initiatives to develop and exploit alternative fuels, we need to maximize our domestic hydrocarbon resources. Recent studies have shown that American oil reserves (including shale) far exceed all of the oil left underground in the Middle East. Right now, year after year, we are giving away $500 Billion of our wealth to foreign countries and dictators to feed our need for oil. How dumb is this? Why not keep the money in our own country, enriching the lives of 300 million people. We need to demand that our government pull their collective head out of the sand. What they have done to us thus far is worse than a high crime or misdemeanor. And none of this has even mentioned the pork orgies they’ve indulged in, nor the annual budgetary waste; waste that no one seems to be accountable for, and that could easily fund most countries entirely. GasPass will be hosting a petition to our government addressing this, called “WE DEMAND RELIEF.” Please take a moment to sign it. Wouldn’t life be a lot simpler if gas was back at a buck a gallon, like it should be? This is the type of initiative that we should be rallying behind. Take 3 minutes to watch this interesting movie about how one company is making a dent in our energy needs, by harnessing solar here in California! The beauty of this is that it’s not just talk; it’s happening right now.